The Coast Guard’s fast response cutter Forrest Rednour (WPC-1129) arrived Saturday at its new California home, marking the first of four of the multi-mission cutters to be homeported at Coast Guard Base Los Angeles-Long Beach, Calif. The 154-foot Forrest Rednour will be commissioned into the service in the fall. It’s latest in the Sentinel-class of fast response cutters that are replacing the aging, 110-foot, Island-class patrol boats as part of the Coast Guard’s fleet modernization initiative. The Coast Guard plans to homeport three more fast response cutters at the base, located on Terminal Island in San Pedro, and each will be commissioned into service by next summer. The cutters will operate throughout the 11th Coast Guard District, which covers California and the international waters off Mexico and Central America. The fast response cutters are designed for a range of missions, including drug and migrant interdictions; ports, waterways and coastal security operations; fisheries and environmental protection patrols; national defense missions; and search and rescue. 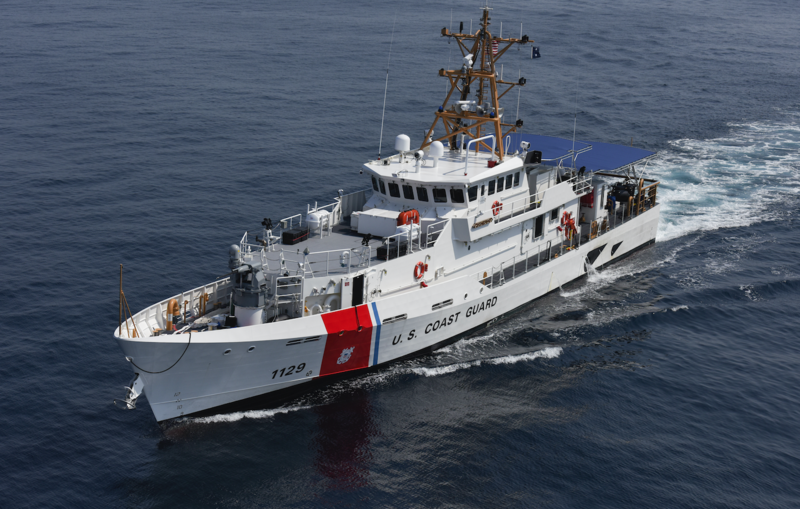 So far, the Coast Guard has accepted delivery of 29 cutters, which are built by Bollinger Shipyards in Lockport, La. Each FRC, with a crew of 24, can operate at a range of 2,500 miles and can conduct patrols of up to five days, according to the Coast Guard. The cutters, which top speed of 28 knots, have advanced command, control, communications, computers, intelligence, surveillance and reconnaissance equipment, improved habitability for crews and can deploy a response force for over-the-horizon missions. Its top speed of 28 knots enables the cutter to operate with other agencies as well as the Coast Guard’s national security cutters. Four months later, Rednour perished along with 100 of the 103-member crew when “an explosion of undetermined cause” sunk the ship, officials said at the time. Only two men survived the attack. They were found floating in the icy waters. Relatives of the two survivors in June marked the 75th anniversary of that fateful day at a ceremony in Michigan, home to Escanaba city.